Custom Cooling System for Meat Processing Plant. Earlier this week we delivered a Custom Cooling System to one of Europe’s leading privately-owned food processors and the country’s largest meat processor. ABP, who have a plant based in Cahir, recently took delivery of a Kilkenny IB-02-0665 ice builder. We had previously designed and manufactured an ice water based cooler for a sister ABP plant in North Tipperary and the application here was similar. 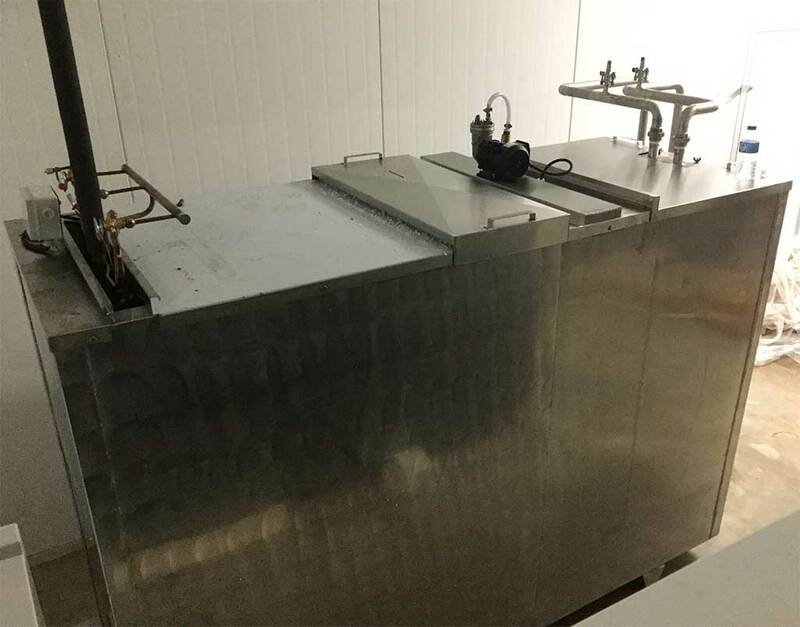 This system provides a supply of ice water which is used to rapidly chill meat products as they are being processed. An unusual aspect of this design is how narrow the chiller is. We had been given a very specific requirement for machine width due to site access restrictions in the plant room where this machine was to be installed. Thus the design had to be altered to maintain the same cooling capacity and functionality while building the machine within tight dimensional restrictions. The plumbing, electrical and refrigeration works on this system were carried out by Kelly Refrigeration of Co. Waterford who are experienced in working on Kilkenny Cooling Systems equipment and in the industrial / process refrigeration sector. Kilkenny Cooling Systems has an in-house industrial and process cooling system design capacity and we pride ourselves in our ability to design and manufacture ice water and glycol chillers to meet with very specific customer requirements. We can manufacture process cooling systems with small ice reserves suitable for ‘under counter’ operation right up to the IB-08-2160 which is our largest ice builder – a machine with over 4,000 kg of ice with a stored cooling capacity of over 340 kWh of refrigeration duty. ABP is a dynamic and multi-award winning food processing company with sixty years of food production industry experience and a well-earned reputation for quality, efficiency and innovation.